We gather for a variety of reasons -- to make new friends or to see old ones, for intellectual stimulation, spiritual renewal, artistic expression, to share ideas, to relax and to have fun. You're about to become part of this unique intentional community. Eliot Institute is a non-profit corporation affiliated with the Pacific Northwest District of the Unitarian Universalist Association. It is managed by a volunteer board of directors made up of representatives from the established conferences held each year. Eliot Institute has been presenting camps and conferences since 1947, and currently sponsors camps each year at Seabeck (July, August, Creative Arts, and Winter). Eliot Institute and other Unitarian Universalist groups are the most frequent users of the Seabeck Conference Center. July Eliot and August Eliot are seven nights; Creative Arts Eliot and Winter Eliot are four nights. Click on any of the camps to the right of this page (or scroll down if you're on a smartphone), for information on upcoming camps. The Eliot community values safety, fun, and diversity. It is the policy of the Eliot Board to make every attempt to provide accessibility to all Eliot facilities and activities for all campers. Many campers are old-timers, having come for years. Newcomers are also a welcome and important part of our community. Newcomers may (upon request) be paired up with returning campers who give support and answer questions while serving as a "Newcomer Buddy." Once a thriving mill town, Seabeck today consists of the Seabeck Conference Center and the surrounding community, including an historic cemetery, pizza, massage therapy, café, and espresso businesses, and the marina. Chuck Kraining is the Seabeck Conference Center executive director. 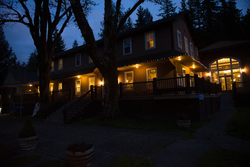 The Conference Center includes over 90 acres with housing, meeting areas, dining hall, woods, a lagoon, beach access on Hood Canal, the Cathedral in the Woods, trails, a swimming platform, tennis courts, volleyball, two children's playgrounds, ping pong, an outdoor fire circle with built-in seating, an outdoor amphitheater, and a craft center. A refrigerator in the dining hall is available for guest use. Guests are advised to leave valuables at home, as most doors to guest rooms have no locks. Silverdale, the closest city, has supermarkets, pharmacies and a mall. It is a 15 minute drive from Seabeck. Scenic Beach State Park is two miles south and west of Seabeck. It has beautiful woods, a picnic area and beach, and a spectacular view. Most cellular phones work here, though depending on your service provider, coverage can be spotty. There are phones in the Inn lobby and outside the Pines lounge for local calls and calling card calls. Wireless internet access is available throughout much of the conference center grounds. Mail received by Seabeck is distributed at dinner. Postage may be purchased at the Seabeck Conference Center office. Outgoing mail is picked up from the office at 4 p.m. The Seabeck office, which also sells souvenirs, is open until 6 p.m. The office can be reached at (360) 830-5010 during office hours or in case of emergency. There is a daily Eliot newsletter at each conference, which provides updates on the daily schedule and recaps on camp happenings. It is distributed at dinner and extra copies are usually available in the Inn. The newsletter is created by the whole community -- you can submit an article in the box in the Inn Lobby. Other announcements and sign-up sheets are usually found on the Inn porch bulletin boards.